From last few month, I was not able to post any new topic. So today thought to post something, but what? Then I remembered how much I had broken my head to start with the SQLite in android. Later I manage to learn it and build a sample Application before I had to start my project. Here I am going to explain the same project which will insert record and display records in the same interface. It may be helpful for my readers. DatabaseHelper(Context context) : invokes to create database by providing the target context with database name and schema version. db.execSQL("CREATE TABLE " + tbl_student + "(id  INTEGER PRIMARY KEY, "
So, here is the class which will take care of creating database, tables and upgrading the database. Then we will create an Interface where we will write the code for insertion of the data into the table and selecting the data from same table. The selected data I have displayed into the list view, as I have shown in one of my previous post. 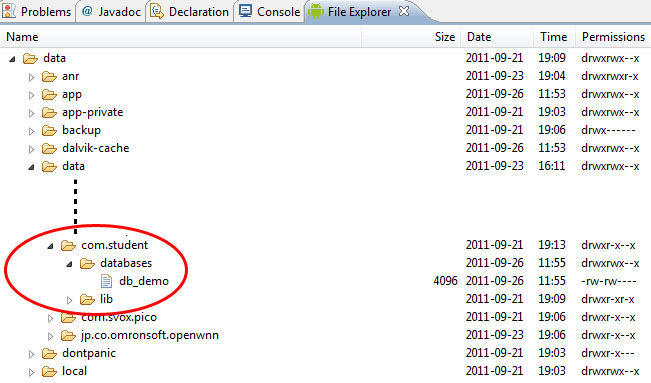 Cursor cursor = db.rawQuery("Select " + dbh.name + "," + dbh.t1 + ","
This is not the end of the project execution. After developing the SQlite project in android, running the application successfully is one another challenging job. While running executing the application we should always check the log for the possible errors and exceptions. 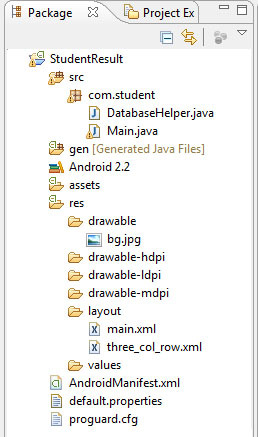 To access database data base, go to command prompt and change location to platform-tools inside android-sdk . Now you are into your database, you can execute the SQlite query for the database. Today one of my readers asked me for help to create simple animation. So I thought, it may be helpful for him as well as others if I could post an example as a topic. 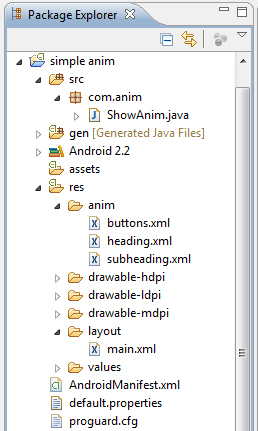 For this example, we will need to create a folder “anim”, inside res. Then create xml files to define animation. So the explorer will look like this. So, here is the code and source project for the example, using what you can create a simple animation for your welcome screen. Few readers of mine has requested me to upload the source project of my previous two examples. Then I decided to add some flavor to them before I upload, which result this example. For mailing concept, I have referred from the Jon Simon’s blog. I tried lots of other way, but his code work very well for me. 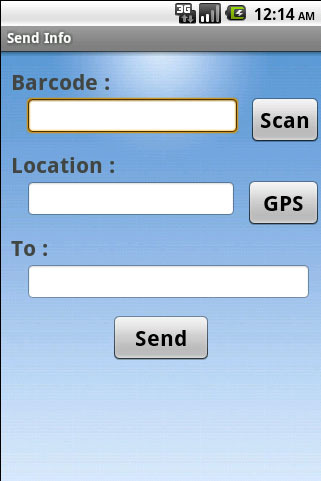 This example is only the combination of Barcode Scanner, GPS and mail. You can download source project from here. The changes you have to make in this downloaded project is, to add any gmail user id and password into sendMail() method, in SendInfo class. As my previous post for dynamic ListView is quite helpful for few readers, here I am with a similar post. 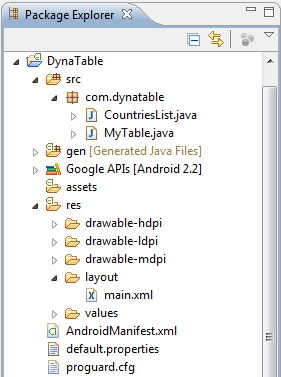 Here I am creating dynamic table. The concept looks similar but the method of creation will differ. While creating a table, we will need to create the TableLayout and from the code we will be adding rows and columns. As the table rows are more, we have to put the table into a ScrollView. 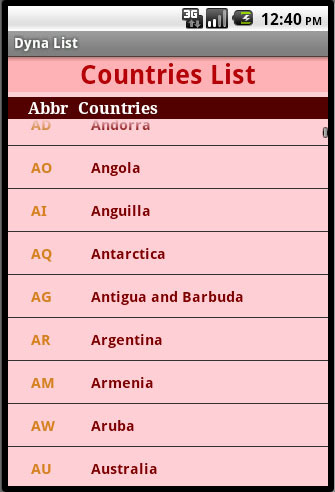 Here is same example given for ListView but will provide the country and its abbreviation in a table. Yesterday one of my readers mail me, asking help for creating the dynamic list. 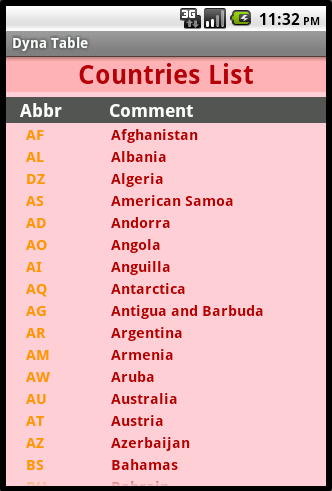 Here is the solution where I have listed the abbreviation and name of the countries in two column list. In this project I have mainly worked with 4 files. CountriesList.java : To store the list of all countries and their abbreviations. MyList.java : It contain the context of the example. Main.xml : for the creation of the layout of the MyList context. Two_col_row.xml : It only contain two TextView for the rows in the ListView. This example can be very much helpful, when you are creating a list from the data from database. Today one another functionality I tried in the android application. It was to provide the longitude and latitude of the current location in android using it GPS system. The coding was quite easy. We have to create a LocationManager and LocationListener. And sending the GPS_PROVIDE, we can get the current location value in term of longitude and latitude. Today, I was able to do a remarkable task in Android. 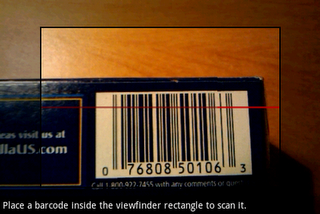 Actually I have got to read barcode using the android camera. First thing came to my mind was, is it possible? But later after goggling few hours, I found zxing , an open source application for barcode scanning which can be embed into our own application. 5. After scan as it returns to our application, I had to put the barcode number into the EditText, which is done by following code. 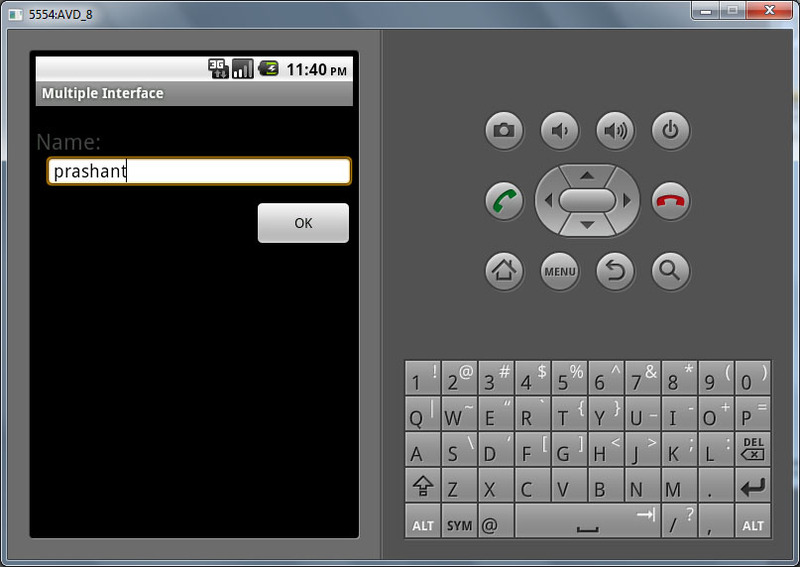 Here I am posting one another Android example for multiple interface communication. While developing most of the application, we may need multiple interfaces. This could be achieve by creating two activities and calling one from another. 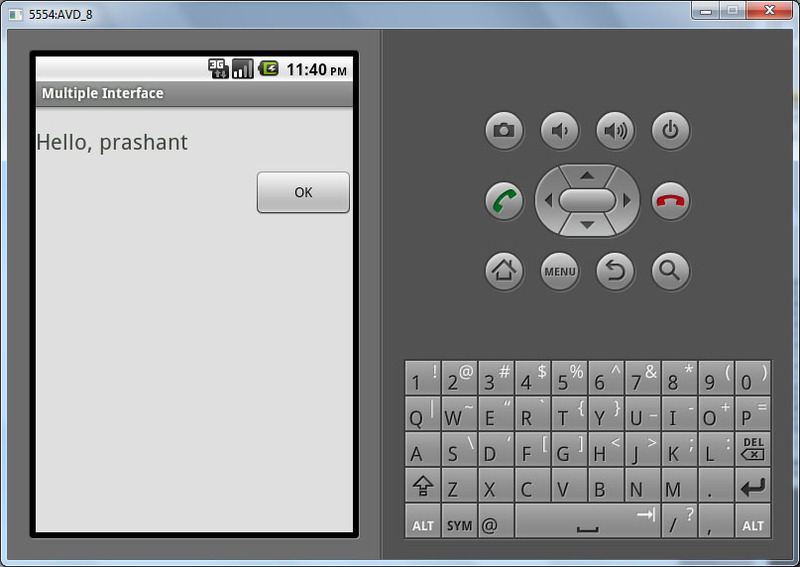 Here in this example, I create TextView(label), EditText(textbox) and Button in main.xml interface. Another activity interface main_hello.xml (we can copy and paste the main.xml and make changes) is created in Project -> res -> layout. Here we provide a TextView(label) and a Button. On FirstActivity.java, which will show the main.xml, we have to add ClickListener to the button. 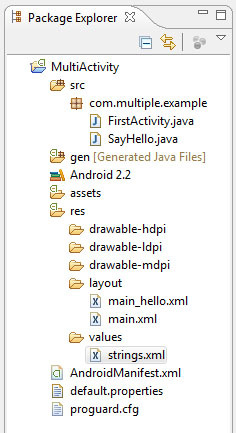 Another interface is created as SayHello.java (we can copy and paste the FirstActivity.java and make changes) which will display the man_hello.xml components with the message (textbox value). And on the click of the button, it will return to the FirstActivity interface. 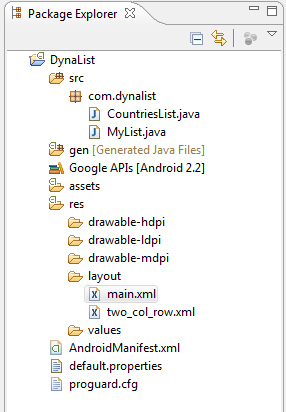 As we have created new Interface (SayHello.java) ourselves, it should be added into AndroidManifest.xml as given below. Last week my friend was stuck for an Android application. That application was to use the remote database (MS SQL Server) for login. Later I saw the coding of Android, which was Java only. Its much like just another Java framework. So I thought to give a try to help him and even I could learn some Mobile Application programming. As Android provide flat file data storage or SQlite for data storage, it was quite tough to access the remote database like MSSQL Server, Oracle or MYSql. Later I found in newtondev that we can execute GET or POST request from the android page and get the output of the requesting page. This lead me to the solution. I sends the form data from Android application to the Server-side page (JSP, Servlet,ASP or PHP), then those page will compile the required operation for login validation using any database , then it returns “1” if the login is valid else return “0”. Here are the source codes that will give you Idea for the application. * Get our single instance of our HttpClient object. * Performs an HTTP GET request to the specified url. 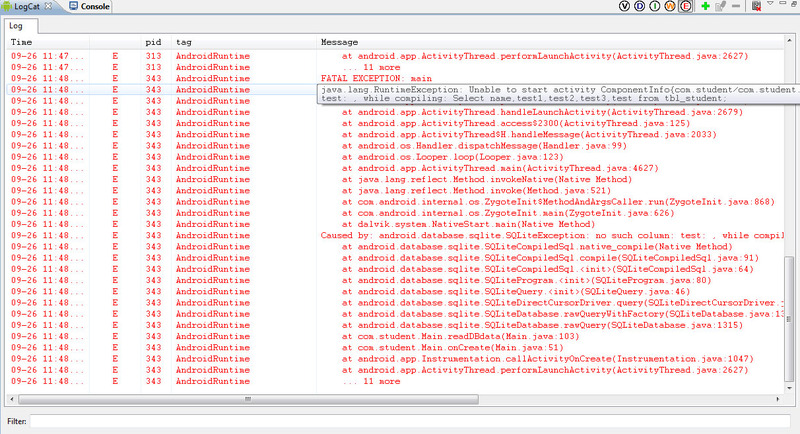 So that the AndroidManifest.xml look like this. 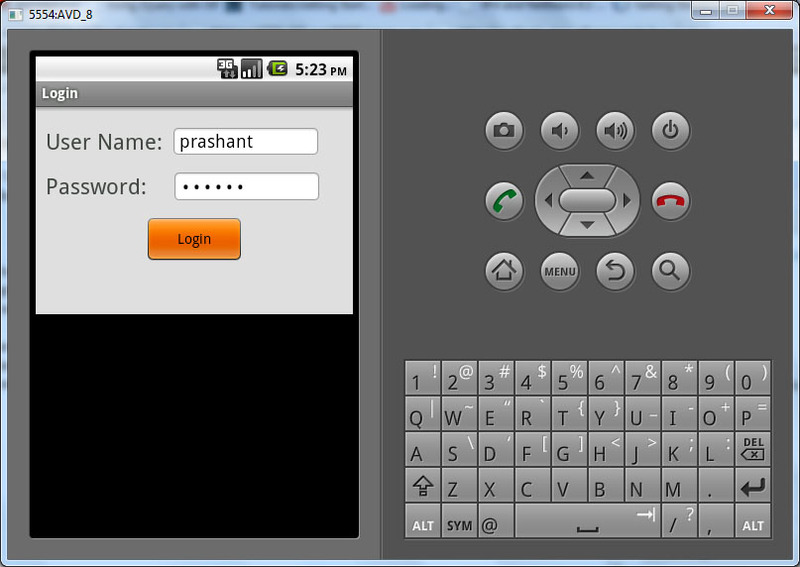 Then on the server-side we can check login by using password. But here in this example I have use a simple servlet, which check the static login.